This next one, I felt a little more serious about. I don’t like fussing with a pencil underdrawing, which I think is what scared me away from ink for so long. Hard to erase ink! But when you’re adding teeny, tiny lines…..I think it’s a bit easier to see where you’re going wrong, so you can redirect. Does this make sense to any ink artists out there? I thought about adding color, but I didn’t want to cover up all of those lovely pen lines. I guess I could do a very pale red watercolor wash…I’d love to hear your thoughts on this aspect. But I digress! I hope you’ll join us for the August version of Draw A Bird Day this Saturday, the eighth! Friday is so close, I can smell it! The cardinals could teach us all a thing or two about shaking our tail feathers! Enjoy the day. Peace. A wash might be nice; are the pens waterproof? I’ve been using Staedtler pigment liners, a set with 4 different widths, but I haven’t decided which I like best. I saw them when I was shopping in Staples and decided to try them. Also my daughter recommended a pen we got in the Japanese store, which is wide, and I’ve been trying that too. The one you’re using looks much finer…is it 0.1? I certainly get different effects depending on the width I use. Pens are very easy for sketching, in a way it seems like cheating sometimes. Thanks! I was really happy with the second one, and I’m hardly ever happy with whatever I post here. They are waterproof, yes, very similar to the Microns. The S (superfine) nib is .3, I think. They make an XS that I don’t have, but thinking about getting, that is .1. I think the finest one micron makes is .05. I love the way this pen is extremely pressure-sensitive, so it feels like I used much finer and yet wider pens all in the same drawing. Just a very slight pressure difference. It (pen) does make it easy, which still shocks me. Non-erasing….whaaaaa? I still don’t get it. And I’m 100% sure that the first bird I drew in pen felt completely different. But it was the micron. Maybe I should try that micron again and see if the brand name makes that much difference? It seems like it shouldn’t. I do know people have strong opinions about particular pens…I haven’t got a favorite yet. I cannot pick my jaw up off the floor…. These are STUNNING! I’m at a loss for words. Extraordinary!!!!! Awh! You are so cute! These are really, really, really outstanding, Laura! Drawing faces and animals is SO your sweet spot! The raccoon, I believe, some time ago, was what drew me in. And I have been a fan of yours and hopefully have become a friend 🙂 ever since!!! You ARE a ROCK STAR! And I always look forward to your daily comments too. You make my day also! Thank YOU for that! Happy Day! Thanks, Rebecca! I always go right in with ink, I guess I wasn’t clear. It seems each time I try to start with pencil I get so fussy that it squashes everything and then I can’t even get the pencil right let alone the pen. But I use such small strokes that I feel more secure just using the pen, that if I go awry at least I can fix it. I think too much if I don’t go right in with pen, it seems. And then I lose it all. I have to go fast and really not think. Awesome work! It’s insane how real a drawing can look coming just from something as simple as ink! Great job! 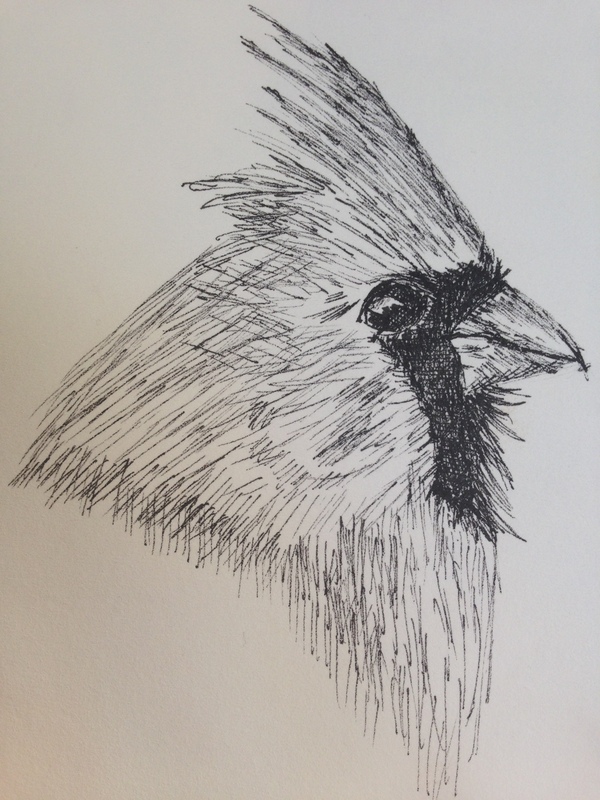 Mind if I put the 2nd picture of the cardinal on my blog with a link to CreatArtEveryday sometime soon? Aww thanks, Evan, I’d be very flattered! Thanks so much, and I’m so glad you like it! He’s great, and he’s got attitude! Nicely done, Laura. I’d not worry about colour on these personally, they are lovely as they are. Great job! You really captured the details. Thanks, Kathy! God is amazing, and nothing makes that more obvious than focusing on nature. 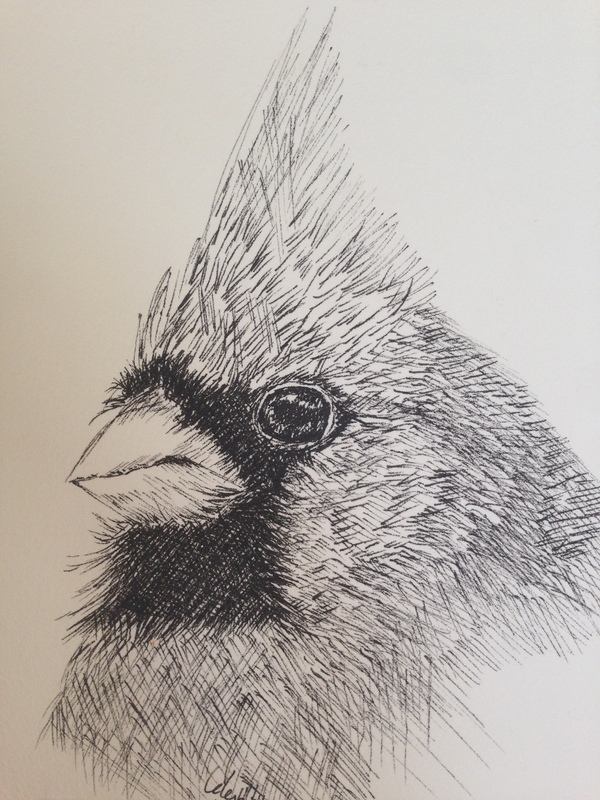 Beautiful line work on the second cardinal :-). I love the texture created by the differently directed lines. I’m impressed by how easily you go straight to pen. I picked up some PITT pens a month ago but I haven’t touched them. I’m, um, clinging to the erasibility of pencil. The photo I used was so tight that you could see where the feathers crosshatched, in most cases. Incredible photos make a huge difference. Hmm… maybe this week I’ll uncap one of my pens and try out your technique. Thanks for the inspiration :-). Lovely. I especially like the second one. It’s truly beautiful. Did I miss Draw a Bird day again? Ah, well I’m glad you did! I still haven’t got these Draw a Bird days entered into my mental Calendar. I hope you join us! I’d like to see wp fly every month! 😀 I’m lucky that birds are probably the first thing I started drawing after my cat. And we have feeders close to the house too, in a rural area, so it’s like anything else, I think. The more you love something and see it, and practice drawing, you get better. I’ve loved birds since I was a little kid. My parents were also and so it’s been bred into me lol. They also had feeders and lived in the country so I think all of that helps. Well, all your exposure and practice certainly shows then because your bird drawings are gorgeous :). I’ll just have to keep practicing by trying to remember these Draw a Bird days from now on. Thank you so much! It means a lot! I am actually just as amazed anytime I come out of a drawing trance and look at the page….and see something I like. The cardinal head and the goldfinch are a couple of the few things I’ve ever done that I actually like. Thanks. You’re very welcome 🙂 I know what you mean. I feel that way with my drawings too sometimes. laura, these cardinals are fabulous! So glad you emjoyed making them. They are so well done! These are awesome! I especially love the 2nd one. Definitely looking forward to seeing what you do on Saturday! I may have to try out those Pitt pens – I’ve been using Microns, but I’ve seen quite a few people who use Pitts & love them. That is a great idea about drawing small lines so that you don’t have as many errors to deal with when drawing with ink. Those are both awesome cardinal drawings! I LOVE this! So beautifully done. You must be so pleased. Hmm, I am always so hesitant to add color to my originals… always worried I will “mess” them up. What about testing it out on a copy of it, to see what it looks and if it “feels” right? Thanks BB! That’s a great idea. I’m also considering Ann’s idea, which was to watercolor the background only. So first I thought red and now I’m thinking a deep green might be cool. The viewer will already put the red on the bird. I’m glad you like this. Can you believe I’m enjoying pen work? I start to see its addictiveness. Do you feel this way about it too? The zen quality? I start to understand the draw now! Oh Yes! I totally am addictive to the pen! It has been so hard to go to other mediums. There is something so refreshing about shading with lines. I started a watercolor painting today… just to keep up the other skills. What a great idea about coloring the background! Oh yes, a forest green would be beautiful. Yes, the plan is for it to be finished for Monday’s blog post 🙂 So far it is coming along as visioned! Nice!! Looking forward to it! Such beautiful portraits of cardinals, frame worthy. Love your enthusiasm and looking forward to seeing more. Thanks, Eileen! You can’t go wrong with Faber-Castell, from my experience. They have yet to make a product I don’t love. I wish you the best with it. Birds are so much fun! I find it interesting that with every subject…..I almost feel like I’m learning to draw all over again. Beautiful drawings, Laura. I especially am drawn to the second one. Looks like he or she could turn his head and look at me. Thank you!! I was pretty happy with the second one too. I’m so glad I tried ink. I didn’t think it could ever be a fit for me. Your line work is ABSOLUTELY fabulous. And if color and shape play is my forte, this is certainly yours, methinks. And that’s the truth. Thanks, C! I definitely have more miles on pen/pencils than I do on my brushes. I think practice is key. I started drawing every night, just something random but I make sure I try to actually draw something, and that’s been about two or so months now. And I focus on not erasing. It definitely pays off. 💛 Anything you consistently do! It’s cool to think about that – sky’s the limit really. I’m determined to become a competent watercolorist. I think practice is key, just like with everything else. It turns me on! :))) I do appreciate your boost, though….we can all use more of those.